There are many people who might be interested in growing their own medical marijuana, particularly if you consider the fact that the use of marijuana is now legal in most parts of the country. When making the decision to do this, one of the important issues you will need to address is the type of medium you will grow it in. The default for many people is to simply grow it in soil, since this is abundant and inexpensive. However, there are other ways of growing it, one of which is through the use of hydroponics. There are many individuals who are now considering growing their marijuana hydroponically, since it has proven to have more benefits compared to any other method. Growing anything using hydroponics simply means placing them in water which will then serve as the main medium for them to grow in. In order to get it done, you will need to get the containers for the water, a surface on which you will grow the marijuana as well as a few supplements that you will need to dissolve in the water. It is these supplements that provide the nutrition for the plants, so you need to pick them carefully if you are to benefit from increased growth. Depending on the number of plants you want to grow, you might also want to dedicate a room for their growth. Ideally, this should be a room with white walls, so that most of the light is reflected to the plants for growth. Of course, not everyone will be in a position to dedicate an entire room or garage towards growing medical marijuana. You could also decide to sort this out by getting a large box in which you can grow the marijuana. This needs to be lined with a reflective material to ensure that no light is lost from it. Light is one of the most important elements needed for the growth of any plants. You will need to invest in LED lamps that can produce light at a frequency that will encourage growth. What are some of the benefits of using hydroponics? As you can see, growing medical marijuana using hydroponics might need more time and effort compared to any other methods. If you are to invest in it, you would need to be sure of the benefits you draw from it. Some of the things you can benefit from by growing the plants using hydroponics is the fact that they tend to grow at a much faster rate. The leaves of the plants tend to be larger and healthier as well, which results in a better yield. 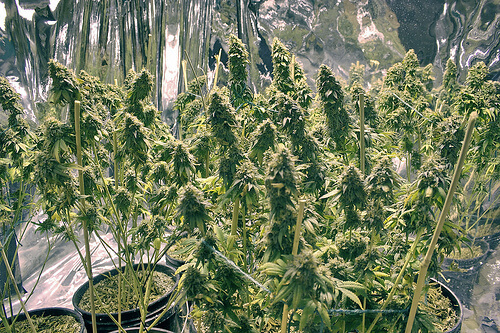 If you do it right, you will find that using hydroponics to grow marijuana will require much less space than otherwise. This makes it a convenient way to grow them when you don’t have a facility such as a garden. A good example of this is when you live in a block of flats. The issue of pests is one that you need to be careful of when you are growing any types of plants. The good thing about using hydroponics is that you will have more control over this. There is a very low risk of having the plants affected by pests and bacteria in the soil, since there is no soil in the first place. This also means that you won’t need to invest in products such as pesticide to keep the marijuana healthy. Growing marijuana using hydroponics is also not as messy as when soil is involved. It will be much easier for you to tend the plants, making it more than ideal for people who want minimal hassle in doing so. If you are interested in using hydroponics to grow marijuana, there are several important things you need to be very clear about from the start. For one, you should do enough research to find out what you will need to grow the marijuana in your own setup. It’s important to have a clear idea of this since it will determine how you should prepare for the process. In addition to that, you should also consider getting some advice from people who have grown marijuana using hydroponics before. You are likely to get tons of information on how to tweak the process to ensure that you get the best results at the lowest cost possible. There is a lot of interested in growing marijuana using hydroponics, so even if you go online you are likely to find a lot of useful information on many sites. In summary, the use of hydroponics to grow medical marijuana should be explored as one of the ways of improving the growth process. It has numerous benefits, and you may even find it to be fun.